Everytime I come across an interesting deal online I share it here as I think our readers can benefit from that and find a certain product at a good price. 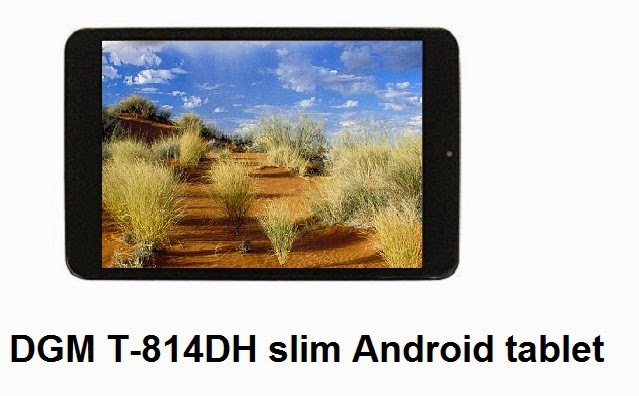 Today I am going to focus your attention at another cheap Android tablet which is not very popular among Android fans and communities - DGM T-814DH. This is basically a slim 8-inch (7.85 inches to be precise) tablet with dual-core processor and 8 GB for storage. The process power is delivered by 1.5 GHz processor which looks more then fine for a cheap tablet but it is coupled of just 512 MB of DDR3 RAM which is qutie low by any standards. The screen resolution is also quite low but considered fine for a tablet of this size - 1024x768 pixels.The operating system is Android 4.2. The Li-Polymer battery capacity is 3500mAh which should be fine for one day of active use. DGM T-814DH has two cameras on board - 0.3 MP front-facing camera and 2.0 MP rear camera. Price: You can find the T-814DH at Amzon for just £50, at eBay UK it is offered a bit more expensive for £75. Currently we can't offer you an in-depth review of the DGM T-814DH tablet as we still haven't got our hands on it for a test but you can check the review for the cheaper DGM T-703.